Dimensions: 26.8 x 11.5 x 7.8mm (1.06 x .45 x 0.31") (L x W x Th). Maximum input voltage: 1.2 volts. Maximum output voltage: 10.0 volts. 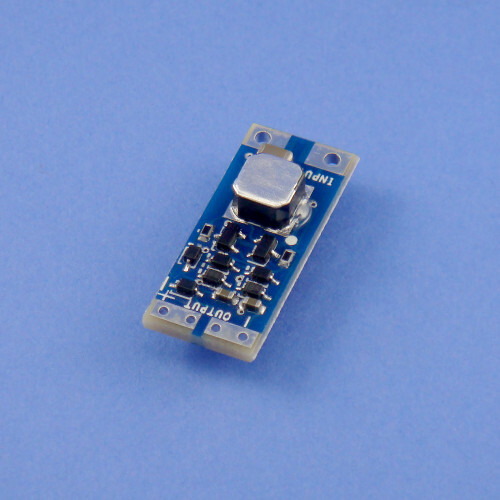 This DC/DC Voltage Booster circuit takes very low input voltage and converts it up to a more usable voltage so you can light an LED or charge a battery. Unipolar input. [you must connect the input wires correctly or else it will not function]. Starts boosting when the input voltage is 80mV (80 millivolts) or higher. Output is 1 to 10 volts depending on input voltage and load. Built in Zener diode clamps maximum output to 10 volts. On-board jumper allows selection of 5 volt clamped output. Very small package size, about the size of a 16 pin DIP socket.